Streets all over the city are becoming ‘environmental crime scenes’ as part of a council crack down on fly tipping. 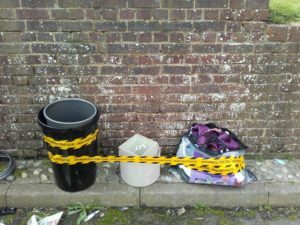 Flytipped rubbish is being marked with special ‘environmental crime scene’ tape to highlight the problem and remind residents that flytipping is a criminal offence. Brighton & Hove City Council is the latest local authority to sign up to Keep Britain Tidy’s ‘Crime Not To Care’ campaign launched to tackle the nationwide problem of flytipping. The city has a major problem with large items of furniture and household goods being dumped in streets – particularly next to communal waste and recycling bins. The cost of removing flytipping, around £40 per item amounting to thousands of pounds each year, is met by tax payers living in the city. Research has shown that many people are unaware that leaving waste next to a bin is a crime which carries a fixed penalty of up to £300. Failure to pay can lead to prosecution, a criminal record and an unlimited fine. Over the coming weeks residents will see flytipped rubbish marked with the tape before it is removed. ‘Crime Not To Care’ posters will also help to raise awareness across the city. The posters and tape are the latest initiative in the council’s efforts to tackle flytipping in the city. Earlier this year, CCTV cameras were installed at flytipping hot spots and dozens of flytippers have been caught and fined. One camera recently captured six separate incidents of flytipping in one night resulting in fixed penalty notices of more than £600. Money raised from fines covers the cost of the cameras. Chair of the environment committee Cllr Gill Mitchell said: “It always surprises me that so many people think it’s ok to dump unwanted furniture and other rubbish on the street assuming that the council will take it away. “But each time the council removes flytipping it’s our residents who foot the bill. “Our campaign sends out a clear message that dumping rubbish in the street is a criminal offence and anyone caught fly tipping faces a hefty fine. There are many ways to get rid of unwanted furniture and other items in Brighton & Hove without breaking the law!. Charity shops and re-use centres are always on the lookout for donations and may collect for free. Residents can also drop off items at the household waste recycling sites at Wilson Avenue in Brighton and off the Old Shoreham Road in Hove. For large items, such as furniture and electrical appliances, the council offers a bulky waste collection service. There is a charge for this service, but discounts are available.